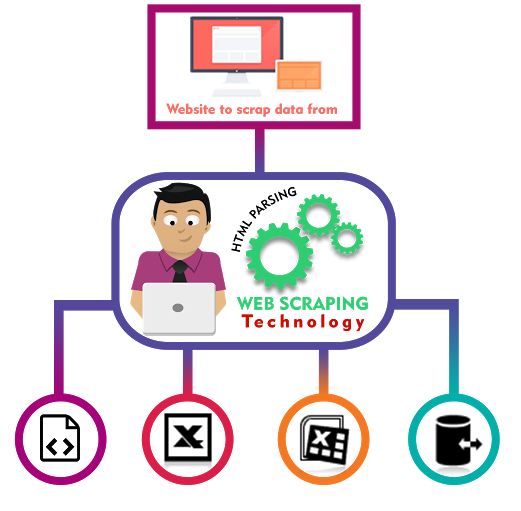 Web scraping is a term used to identify the acts of extraction of data from websites in the Web. Basically, it is the method for collection of data from Web. Also known as web harvesting, web scraping has become an important tool for businesses and consumers alike to know the consumer patterns visible in the market. Scraping services can be done manually or by a programmable bot. The web or data scraping programs can be collecting data for selling them to a prospective buyer or for promotional intent. The web scraping is still currently developing with the advent of new techniques for smoothly collecting the specified bits of information without harming the integrity and privacy of users. Some of the commonly used techniques are human copy-paste, pattern matching, HTTP programming, vertical aggregation, etc. Where is it used and why? The field of web scraping is ever evolving and the number of companies or businesses employing web data scraping services for the benefit of their services are increasing exponentially. Data is so much value that no business can hardly without it. Real Estate gatherings- It is a well and potentially large field for web scraping to collect information on listed property sites. The users are varied with all MLS companies and particularly many real estate agents based in cities do work out with the help of web scraping. It is a genuine approach, saves a lot of time and effort with the guarantee of positive results. E-commerce- This particular industry is super competitive in terms of its product stock, budget and pricing plans. It is better to keep track of the competitor but if done by manually it can take serious manpower and time investment as they can take several web pages to consider. Data scraping plays a huge role in collection and analysis which helps the brand to cope better with the market. Huge e-commerce players like Amazon, Flipkart, and Walmart are all known to use web scraping. Email address gathering- This technique tends to be a promotional attempt. At first, the advertisers collect email addresses of people who might be potential customers for their product. The emails are then sent in bulk, forming a part of email marketing and a favorite to companies. Data scraping helps to collect email addresses from various social media platforms or even blogging sites. Website creators- Even the website creators use the data scraping tools to collect trends upon a particular subject to which their website deals with. It is fairly common to view similar websites dealing with the same The scramblers help to collect the information from that site, indexed into one. This is one popular use but it increases the fear of plagiarism. Research Results- It is not uncommon to see data being the backbone of academic research. For this, a large data set needs to be collected and analyzed to indicate a certain conclusion. If done manually it is a tedious task which if done with data scraping can automate the process. This is used by research companies. Web scraping has become an indispensable asset for the industry. Every decision, every aspect, every strategy is fuelled by data, which can be collected by data scraping. Data scraping is cost-effective, provides faster responses and can be quickly analyzed by making it a popular choice for many.